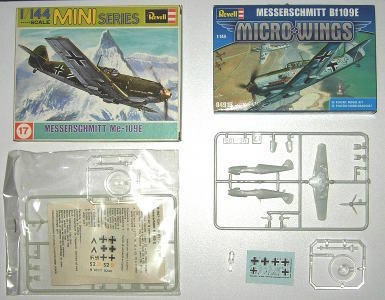 This Revell Messerschmitt Bf.109E is one of a series of old 1/144 scale model kits, some of which recently got re-released as 'Micro Wings' series. There is a limited choice of 1/144 scale Bf.109E kits: apart from this Revell Bf.109E kit there is the AHM/Mitsuwa Bf.109E kit and prepainted Bf.109E-3 and Bf.109E-7 trading models from the Bandai 'Wing Club' series Vol.1 and a Bf.109E-4 and Bf.109E-4/Trop from F-Toys 'Wing Kit' Vol.7 . Of these the F-Toys model is the nicest, accuracy and detail of the Bandai model is at a level similar to the Revell kit. The Mitsuwa kit lacks some detail but could also be turned into a decent looking 'Emil'. 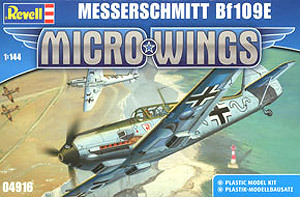 Kits of later Bf.109 types are available from Sweet who does a pair of very nice Bf.109F models and from Mark I Models who recently rereleased the former Eduard Bf.109F and Bf.109G kits. The Mitsuwa Bf.109E was also sold as Bf.109F without any changes to the parts. 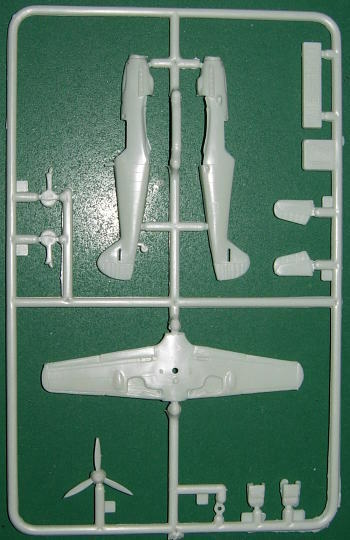 This 'Micro Wings' Bf.109E kit is generally accurate but lacks some details, in particular the tail plane struts and cockpit interior. 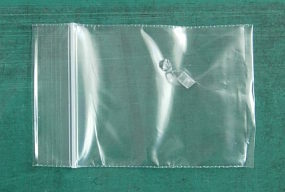 Open the box very carefully: the canopy is small enough to slip through the safety holes in the polythene bag, so make sure the carpet does not swallow it . After opening the box I put the canopy in a separate small sealable bag. 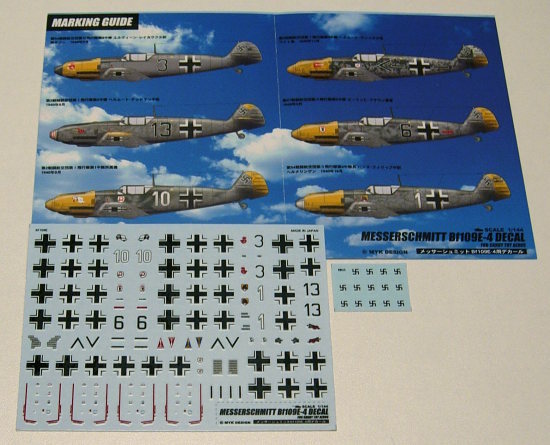 Replacement decals were made by Print Scale, set 144-014 'Messerschmitt Bf-109 E' and Japanese MYK Design, sets A-01'Messerschmitt Bf109 E-3', A-02 'Messerschmitt Bf109 E-4', A-03 'Messerschmitt Bf109 E-7' and A-345 'Messerschmitt Bf109E Super Aces' (all MYK sets no longer available). 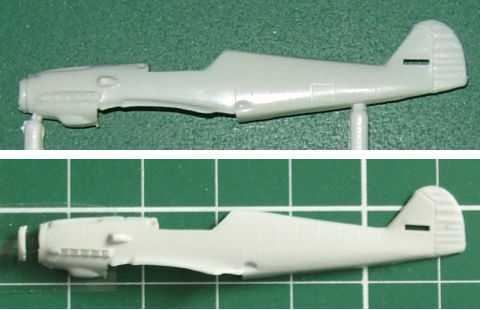 As usual with kits from old patterns, the first thing to do is to remove some flash and fill any sink marks, there were only some shallow sink marks on the upper wings opposite the canon bulges on my Bf.109E kit. Also plug the hole for the stand using either the tip of the stand or a tapered piece of stretched sprue. 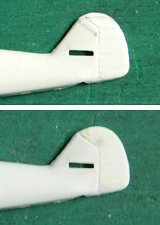 While removing the excess flash, also correct the shapes of the wing tips and propeller blades. The Revell Micro Wings kit comes with 4-view painting instructions based on accurate scale drawings, the scale of which works out to 1/148 so these drawings can be used to check and correct shapes. The wings are a single piece. The dihedral should be 7°, is only 3°. I made a jig out of thick plastic, bent the wings to about the right angle, taped the wings to the jig and held the wing in hot water for a minute or so. The shape of the wing tips is somewhere between that of an E and the more rounded shape of an F model, for a proper E the wing tips should be less curved and the wing tips apex should be moved slightly forward of center. Both corrections result in a small reduction in wing span, but I'm fine with that. 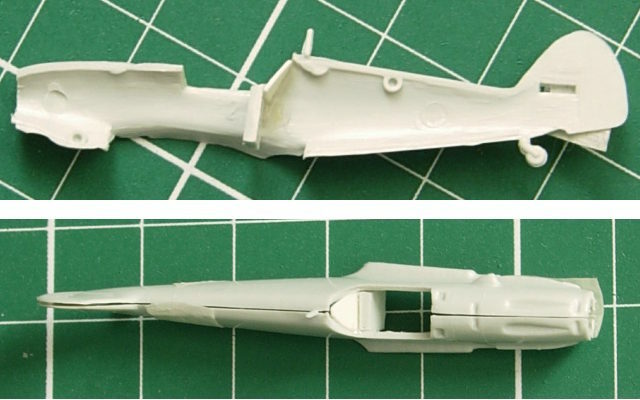 After the hole for the stand is filled and smoothened, a 9.0mm long ridge needs to be added to the center of the fuselage/wing section, it should start right behind the little scoop. 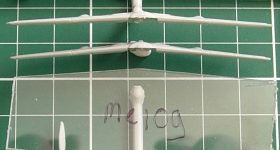 I made the ridge out of some half-round stretched sprue with a width of 0.3mm. The main wheels in the kit come with raised wheel hubs, however the wheel hubs should lay slightly below the widest part of the tires. The main wheels also look a bit too skinny, the actual width of the tires should be about 1.0mm. The exact diameter of wheel plus tire should be 4.5mm. 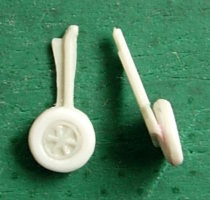 The wheels should be set at a slight angle to the legs. I decided to cut the wheels in halves along the insides of the wheel doors and to use two discs for each wheel, one slightly wedge-shaped disc sandwiched between the halves (similar to what I did with the Spitfire wheels), the other disc on top of the wheel to make the tire protrude above the hub. I cut two pairs of 4.5mm discs, of the first pair I sanded the lower halves of the discs down to a wedge and glued each disc with its unsanded side to a wheel halve, making sure the thinnest edge ended up at the bottom of the wheel. With the second pair of 4.5mm discs I drilled a 2.3mm hole in the center of each of the discs, then carefully widened the hole with a round rats tail file until it fitted perfectly around the hub. I used a hand held 5.0mm ball shaped cutter head to round off the outer edge of the hole. After assembling the wheels I rounded off the outer edges. To achieve the bulbous shape of the tires I glued a length of stretched sprue (of about 0.5mm diameter) around the wheels and with some careful sanding merged the edges of the sprue with the tire. To improve the look of the hubs, I added a rim out of thin stretched sprue. The hubs have a diameter of about 2mm, so I wound some stretched sprue (of about 0.2mm diameter) around a toothpick of similar diameter and poured some boiling water over it. This resulted in a nice coil of stretched sprue of which I cut single loops to create the rims. The front edges of the wheel doors should be rounded slightly to match the curve of the wing. 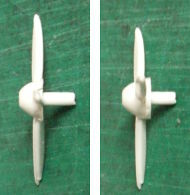 An odd error needs to be corrected: the rear part of the spinner is molded in with the fuselage. Carefully cut along the recessed line and save the pieces that were cut off. A new front piece for the nose can be cut from the large '17' number tab, the front of this piece should be perfectly round with a 5.0mm diameter, its edges should flare out to fit the nose. The top of the nose is a bit too narrow, I inserted a strip of 0.25mm thick plasticard between the halves to correct this. The fuselage is quite flexible so despite the insert the joins in the lower nose and the rear of the fuselage will still close. The intake on the side of the nose is just a tiny blob, it should have a grille out of vertical strips, the intake is at an angle of about 60° to the fuselage. The kit intake is too small for just sanding the front flat and scratching in some lines, so I made a replacement grille out of strips of thin plasticard. 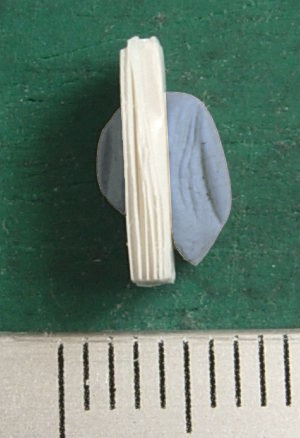 I cut two strips of 80mm long and of constant width one about 0.5mm wider than the other. I divided each strip into strips of 10mm long. To set the grille at a 60° angle I folded a tray out of some stiff tin foil with one end at 60°. Then I stacked the strips in the tray, alternating wide and narrow ones and applied a tiny bit of thin glue to the side of the stack and after curing another bit of glue to the bottom and the other side. I made the piece a lot wider than the 0.7mm width I actually need just because it is so fragile, on the picture the top part is already mangled just from handling it (the marks on the ruler are 1mm apart). I trimmed the top of the alignment pin in the upper fuselage to improve alignment. The 'wheel bay' for the tail wheel is missing, its contour needs to be cut using a round rats tail file. 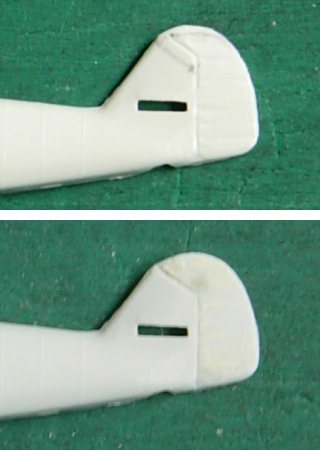 The tail fin is 1.0mm too tall and the slanted part of the rudder hinge line should be rescribed at a location 1.0mm lower. The exaggerated fabric effect on the rudder and elevators should be filled and sanded down. The picture shows the original tail with the 'fabric' bulges already slightly sanded down and pencil marks for the new top contour and the new hinge line (top) and the end result after filling, sanding and rescribing the hinge line (bottom). I made a new radio mast out of some thin copper wire which I flattened slightly between a pair of flat nosed pliers. 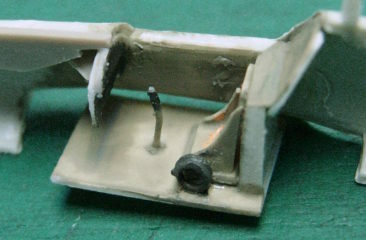 The fuselage could do with some cockpit interior, in particular the missing rear deck below the rear window is obvious. The kits cockpit is completely empty, so I added some basic details from scratch: instrument panel, rear bulkhead, sloping rear deck below rear window, seat, floor and stick. 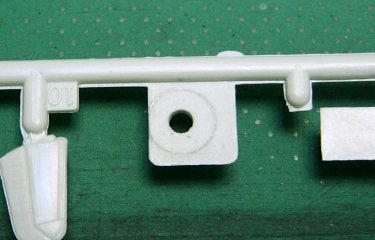 The rear bulkhead is 4.5mm wide at the bottom, 4.0mm wide at the top and 5.5mm tall. There should be a 1.0mm horizontal step between the sloping rear deck and the front of the rear bulkhead. Using a piece of thick plastic for the bulkhead is an easy way to recreate the step, a part of the 'ME-109' name plate in the kit is perfect for this. The sloping rear deck has to be cut to fit from a 4.0x4.0mm piece of plasticard. The seat consists of a piece of thin plasticard of 6.0mm long, 2.0mm wide at the top and 3.0mm wide at the bottom, with the lower 3.0mm rolled into a curved seat and sides added from a piece of 3.0x3.0mm cut diagonally. After assembly file the edges of the sides of the seat into a curve (marked red in picture). The seat is mounted on a .25mm thick piece of 3.5x3.0mm plasticard on the floor. The floor measures 10.0x7.0mm and is attached to the rear bulkhead. A 0.4mm hole for a control stick was drilled in the center of the floor. 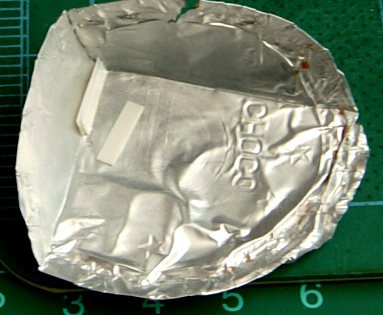 The instrument panel is 5.0mm wide and consists of two parts: a 1.5mm tall raised panel at the top over a 6.0mm tall panel. The panel is sanded to fit the fuselage halves. The raised section should line up with the edge of the cockpit. The narrow lower part of the panel measures 3.0mm tall by 1.5mm wide and is bent slightly forward, this panel holds the bomb release selector switch and was only fitted to JaBo versions. No need to go overboard on detailing as the canopy is not very clear so small cockpit details won't be visible anyway. I did end up adding the pair of black wheels to the left of the seat as these are quite visible from above. The sprue is attached to the lower edge of the windshield so the base of the windshield and its frame need some careful cleaning up. To improve clarity I polished the canopy with a piece of rough paper. 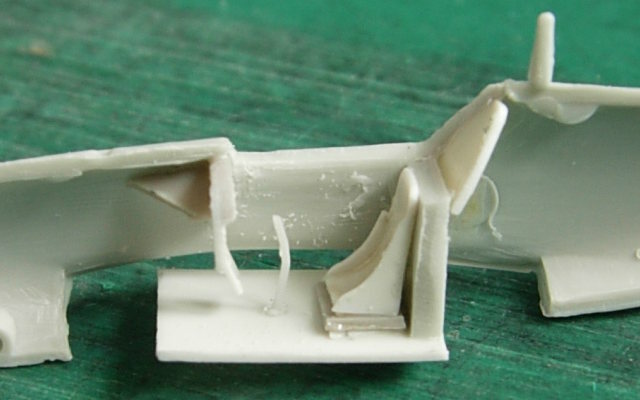 The canopy sits a bit too low on the fuselage, adding a small strip of 0.15mm thick plasticard to both cockpit sills fixed this. 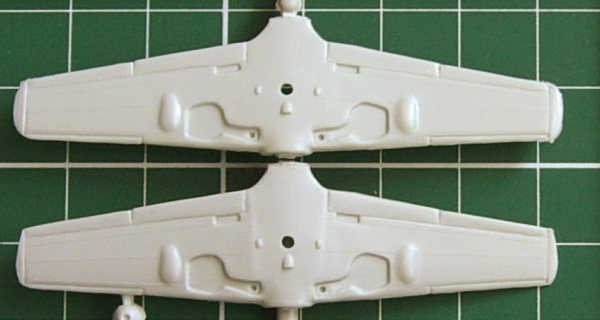 Many Bf.109E-3 and -4s were fitted with an armor plate with headrest inside the canopy but some were not, so better check references. The aircraft depicted on the kit decal sheet did not have an armor plate fitted. 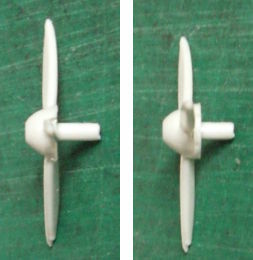 The rear of the spinner should be extended using the piece that was cut off the fuselage and the shape of the propeller blades and tips should be corrected. 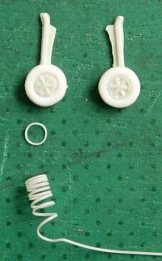 To be able to fit the propeller after joining the fuselage halves I changed the propeller assembly to one similar to that of the MicroWings Spitfire, using ring pt.6 as a bearing and making a new end cap out of sprue. 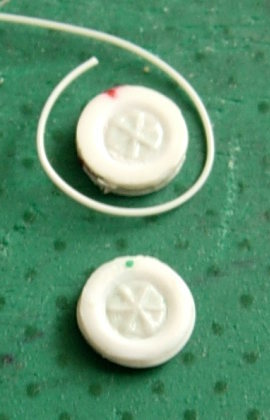 The diameter for the hole in the ring and the cap is 1.3mm. I enlarged the hole in the front of the nose to 2.3mm to be able to fit the assembled propeller. The aircraft depicted on the kit decal sheet is a Bf.109E-4 (III./JG2, Gruppenkommandeur Major Erich Mix) that crashed at Roye, France on May 21st 1940. 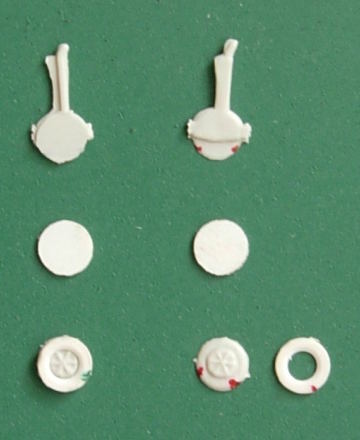 The kit decals appear accurate in design and well printed but the 'R' in the Richthofen emblem is printed in black instead of red and no swastikas nor service markings are included. 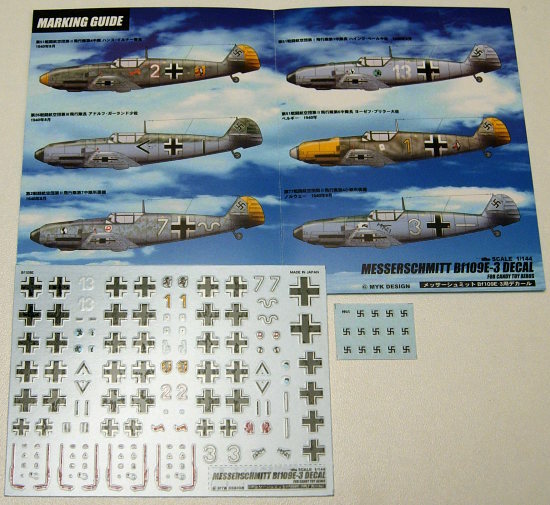 Fortunately MYK Design decal sets A-01 and A-02 do contain the same JG2 emblems and come with plenty of swastikas as well as additional service markings and walkway lines. 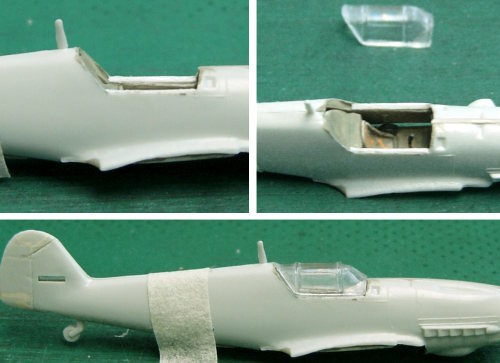 This particular aircraft is RLM 65 Hellblau overall with the top of the fuselage, wings and tailplanes in a splinter pattern of RLM 71 Dunkelgrün and RLM 02 Grau as correctly indicated by the kits painting instructions. A sideview drawing in the SAM Combat Colours 1 book indicates that the front half of the spinner forward of the propeller blades should be painted red. For the cockpit interior I picked the new Humbrol 240 'RLM 02' instead of Humbrol Authentic HG-6 'RLM 02 Grau' because the shade of the new paint is more greenish and a bit lighter, which looks more appropriate for the small scale. For fuselage camouflage I picked Revell 45 'light olive' for 'RLM 02' as it is a very close match to Humbrol 240 but the Revell paint covers better.